2010 10K (first time I have seen this precise language): "We have three SPAs in place concerning LibiGel. The first SPA [received January 2008] agreement covers the pivotal Phase III safety and efficacy trials of LibiGel in the treatment of FSD for “surgically” menopausal women. The second SPA covers our LibiGel program in the treatment of FSD in “naturally” menopausal women (received July 2008, to my knowledge no clinical trials have been run yet for this indication). The third SPA agreement covers the LibiGel stability, or shelf life, studies for the intended commercialization of LibiGel product." Libigel is v low dose (300 micrograms per day) so no acne or hair side effects [ie, safety concerns are representative of post vioxx fda change- not specific to this product]. 11/2010, 2/2011, 5/2011: based on 2009 IMS data and primary research, now say >4m off-label prescriptions per year are filled in the US. Previously stated 2m off label rx/yr currently plus 1m more at formulating pharmacy- but testosterone doses that are too low or too high lose effect. 4/15/11 webcast: think female sexual dysfunction market is bigger than the $2b male ED because 43% women have sexual dys vs 31% for male, according to studies. Click here for BLOOM-1 first trial ClinicalTrials.gov listing. Click here for BLOOM-2 second trial ClinicalTrials.gov listing. Efficacy SPA w/ FDA covers: study design, efficacy endpoints, sample size, study conduct, statistical analysis plan. Co-Primary endpoints are "The change in the 4-week total number of protocol defined satisfying sexual events [see next bullet] from the Baseline period to Weeks 21-24 as recorded by the subject in her diary [do this daily, using FDA-validated instrument], the Inventory of Sexual Events and Desire (ISED), a validated instrument for HSDD" and "The change from Baseline to Weeks 21-24 in the mean ISED desire score"...Secondary efficacy endpoint: "Change from Baseline in the mean Female Sexual Distress Scale-Revised (FSDS‑R) Question 13 score"
expect much higher increase than that based on double-blind, placebo-controlled p2 data. Libigel produced a blood testosterone level in the normal range for premenopausal women. Give patients a bottle with 3 month supply, can weigh to monitor compliance. 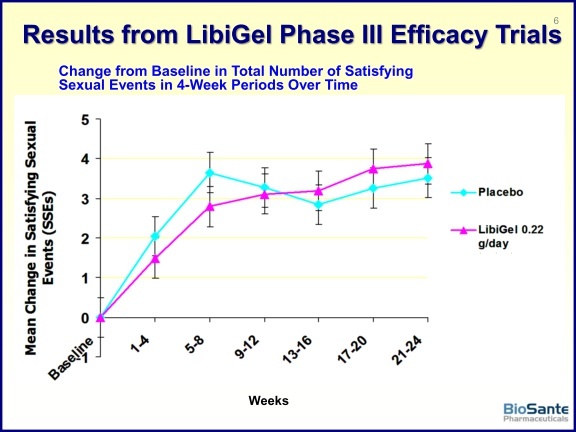 7/2010 started trial in new indication to measure effect of Libigel on congnition in menopausal women (120 pts, RDBPC, 6 month tx in australia). 10/2010: started continuation study to see if beenfit persists 4 wks after stopping libigel- 750 pts, est complete 9/2011. Click here for ClincalTrials.gov listing. Goal: "Demonstrate that the ratio of the rate of CV events on LibiGel 300 mcg/day compared to placebo has an upper bound of the 96% confidence interval ≤ 2"..primary endpoint is a composite outcome measure consisting of the total number of: CV death, nonfatal stroke, nonfatal myocardial infarction, hospitalized unstable angina, coronary revascularization, and DVTs. Trial was initiated 1/2008, halted enrollment to save money 4/2009, resumed 1/2010. ---6/2009: passed blinded safety look (>1000 pts and >600 pt years). ---8/2009: passed blinded safety look (>1250 pts, 825 ptyrs, >900 over 1 yr, >100 over 2 yrs, 7 CV events, no deaths). ---10/2009: first UNblinded safety look (1055 pts, 883 pt years, 1 MI, 3 BC, no deaths). ---2/2010: second UNblinded safety look (>1200 pt years, 6 CV events, 4 BC). ---6/2010: third UNblinded safety look (1500 pt years, 7 CV events, 4 BC). 9/10: >2000 enrolled (>1000 over 1 yr). ---10/2010: safety presentation (2300 pts, avg 10.5 months of drug, 14 events 0.65%, 7 BC 0.32%- these rates are 25-30% of what was expected). ---10/18/10: hit 2500 enrollment, triggered 4th unblinded safety evaluation and first unblinded CV statistical evaluation, will continue to enroll and evaluate again after each event (2300 pt yrs, avg 10.7m on drug, 850 >1yr, 400>2 yr, 14 CV events, 7 BC). ---2/12/2011: 5th unblinded safety review announced: 2869 pts, >3000 women-years on drug, 17 CV events (0.57% rate), 8 breast cancers (0.27% rate)-- cannot yet terminated enrollment, continue study as per protocol, average enrollment now >12.5 months, >1000 on trial over 1 yr, >550 on trial > 2 years. - click here for press release - click here for my blog post about this event. ---6/2011: 6th UNblinded safety look (3307 pts, >3450 women-yrs, 22 CV events: 0.58% rate, 9 breast cancers (0.24% rate). Average exposure now 12.8 months, >1500 on trial over 1 yr, >700 over two years. By the time DSMB met and enrollment halted (see below), 250 additional women had been enrolled bring total to >3550 women and >3800 pt-years exposure. ---2010 10K: end of Feb 2011, ~2900 enrolled. ---3/15/2011 webcast: enrolled ~3000 women and have ~3200 pt-years of exposure. 3/30/2011 press release: over 3000 pts enrolled. ---6/6//11 Announced completion of enrollment with a total of >3550 pts (Click here for PR). 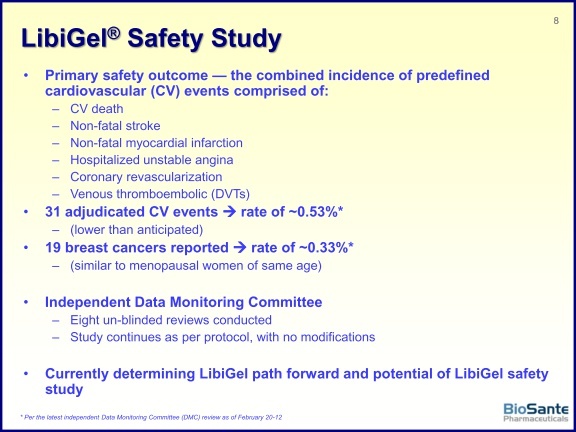 "The FDA-agreed sample size analysis indicates that enrollment should stop, based on meeting a minimum 90 percent predictive probability of success of the safety study to show the safety of LibiGel at the primary data analysis... one or both of the following criteria one year after enrollment is completed: the ratio of the rate of CV events on LibiGel compared to placebo has an upper bound of the 97.2% confidence interval ≤ 2, or the 97.2% confidence interval for the risk difference is ≤ 1% (and less than twice the observed CV events in the LibiGel group vs. placebo group)." Last pt was enrolled early June 2011 (would have reached maximum 4000 pts in July or August 2011), so study analysis will be conducted 12 months later, in 6/2012 (though sfety evaluation continues for 5 year for each woman). At that point BPAX can work on processing and analyzing data for a late 2012 NDA submission. Will BPAX get any efficacy data from this trial? The July 2011 Leerink Swann analyst report says yes - they claim that BPAX can use data from naturally menopausal women in this trial to show efficacy in this group (the efficacy trials described above include only surgically menopausal women). However, this is counter to my notes, including from 5/9/11 webcast in which BPAX said they would get "minimal efficacy data" from the safety study.